"[Prison gerrymandering] distorts the political process and raises concerns about the fairness of the census process itself." [Prison gerrymandering] distorts the political process and raises concerns about the fairness of the census process itself. 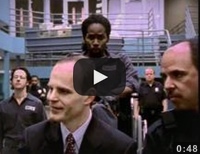 That’s reason enough for the bureau to solve this problem now. The Bureau is aware of our organizations' concerns about prison gerrymandering, but side-stepped our request to prioritize developing a solution. The Census Bureau has replied to the February 14 letter from 210 organizations urging it to make “developing a methodology to tabulate incarcerated people at their home addresses a near-term priority.” I wanted to share the Census Bureau’s response, along with some of my thoughts about it. In a nutshell, the Bureau is aware of our organizations’ concerns about prison gerrymandering, but side-stepped our request to prioritize developing a solution. Our coalition letter was intended to inform the Census Bureau that a diverse group of stakeholders wants the agency to start planning how to tabulate incarcerated people at home. In our view, the Bureau needs to recognize that the prison count is the largest and most visible failing with regard to where it tabulates people in the decennial enumeration, and start researching solutions now. But in his reply to our letter, Acting Director Thomas Mesenbourg explained that the Bureau would not focus, in the near term, specifically on the issue of where the census tabulates incarcerated people. Instead, Mr. Mesenbourg described how researching solutions to prison gerrymandering fits into the Bureau’s current longer-term agenda: as one part of a much broader inquiry on residence rules that will take place — budget permitting — in Fiscal Year 2015. That falls far short of what we asked for, but the clarity of the Bureau’s response is helpful in determining our next steps. I wanted to share some further thoughts about the Acting Director’s letter, and some ideas moving forward. The reply letter nicely summarizes the overall challenges the Bureau faces to maintain the quality of the decennial census while controlling costs, listing the four areas where the Bureau is currently focusing its energy. The Bureau then gives an update on an important moving target: exactly when research on improving the group quarters count could take place. The problem of prison gerrymandering may be one of the most glaring defects in the Census, but, as the reply letter explains, the Bureau is instead prioritizing work on fundamental changes in the structure and operations of the decennial census in order to trim several billion dollars from the cost. I can see how the Census Bureau might, in contrast, view improving the tabulation of just one group of people — no matter how glaring the problem — as a lower priority. The strategic challenge for our movement is not the complexity of the research required, it is the timing. Improving how incarcerated people are counted is not rocket science, but it does requires diligent planning. After all, people in prisons and jails are the only population in the country that the government counts multiple times every day. The Bureau needs sufficient time to find solutions to legitimate questions about the best way to collect and process these data. In the reply letter, the Acting Director says that “research [on] other aspects” of the 2020 Census can begin only after the “high-level design” is completed, in 2015. This delay is potentially, though not definitively, problematic for the efforts to end prison gerrymandering by the next redistricting cycle. 2015 isn’t necessarily too late to begin researching how to tabulate incarcerated people at home in 2020, but it leaves a very small window of opportunity because the details of the 2020 Census will be locked in place long before 2020 rolls around. Unless the Bureau articulates a clear intent to pursue methods to tabulate incarcerated people at their homes of record, the passage of time will leave the Bureau will no choice but to continue its outdated methodology in the 2020 Census. While our letter acknowledged the Bureau’s budgetary challenges, our letter asked the Bureau to include ending prison gerrymandering in its near-term priorities. Unfortunately, the reply did not address the matter of priorities directly or explain why the Bureau can’t begin the process of planning improved ways to tabulate incarcerated people while it completes redesigning other components of the Census. Supporters of the constitutional principle of “One Person, One Vote” should be very concerned by the prospect of relegating the question of how incarcerated people are counted — the most visible fairness flaw in the decennial census — to only one piece of a larger research question that will not start until 2015, budget permitting. The Census Bureau has the power to end prison gerrymandering, and the letter’s summary of the Bureau’s residence rules methodology since the Census Act of 1790 supports our position that the Bureau has the authority to revise its methodology to keep pace with social and demographic change. The question of where to tabulate incarcerated people is clearly within the Bureau’s discretion, but, as the Acting Director noted, the Bureau looks to Congress before making any changes that could be vulnerable to criticism. Finally, the Bureau’s concern that “major change … regarding apportionment” necessitates the assent of Congress is a red herring. Congressional apportionment is unlikely to be affected by tabulating incarcerated people at home because most people do not cross state lines when they are incarcerated. But beyond congressional weigh-in, the Census Bureau wants to get the input of as many stakeholders as possible before making a change to where incarcerated populations are counted. That is yet another reason why the comparatively straightforward activity of improving where incarcerated people are tabulated needs to start sooner rather than later. Finally, the Bureau’s reply is a good indication of how much work we have left to do to establish why it is necessary to change where incarcerated people are tabulated. The letter, in my view, both understates the impact of prison gerrymandering on local and state governments and undervalues the Bureau’s own significant efforts to help those local governments by producing the Advance Group Quarters Summary File. 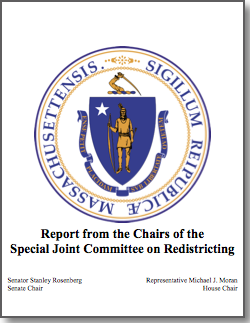 This file, which the Bureau produced for the first time ever in 2010, was incredibly helpful to many state and local governments that wanted to eliminate, minimize or at least consider avoiding the effects of prison gerrymandering. The driving reason to address prison gerrymandering is its dramatic impact on state and local governments. It is easy to understand why the Census Bureau, as a federal agency, might prioritize questions of congressional apportionment over state legislative, and even county/municipal, redistricting. But congressional apportionment is not the primary concern because prison populations are rarely significant in determining a 700,000 person Congressional district. The real impact of prison gerrymandering is at the state legislative level and, especially, at the county/municipal level. The smaller the legislative district, the more likely it is that a single prison could make up a large part, or even an actual majority, of the district. Taken together, prison gerrymandering’s impact is pervasive, and the overwhelming majority of the nation will benefit in at least one way when the practice comes to an end. As general messaging point, our movement needs to ensure that the real reasons to end prison gerrymandering remain in focus. 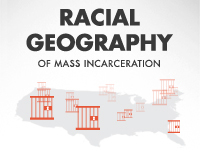 Moving forward, it is imperative that the Census Bureau continue to hear from all of its stakeholders — at the federal, state and local levels — that now is the time to address the problem of prison gerrymandering in order to resolve the problem by 2020. We shouldn’t have to wait until 2030 to fix such an obvious flaw in the Census Bureau’s methodology that compromises state and local democracy around the nation. 210 civil rights, voting rights and criminal justice organizations sent a letter calling on the U.S. Census Bureau to seize a timely opportunity to research alternative ways to count incarcerated people in the decennial Census. Easthampton, MA – Today, more than 200 civil rights, voting rights and criminal justice organizations sent a letter calling on the U.S. Census Bureau to seize a timely opportunity to research alternative ways to count incarcerated people in the decennial Census. Although the 2020 Census is seven years away, the Census Bureau is already deep in the planning process. The letter calls on the Bureau to pave the way for a national end to prison gerrymandering in 2020 by prioritizing research on how to count incarcerated people at home in the next census. “In order to develop the best possible methodology for fixing prison gerrymandering, the Census Bureau needs to address this research question now,” said Brenda Wright, Vice President of Legal Strategies at Dēmos. The letter charges that “…Failing to count incarcerated people at home for redistricting purposes undermines the constitutional guarantee of ‘one person, one vote’, with critical implications for the health of our democracy.” For that reason, the organizations note, four states and more than 200 counties and municipalities have made their own adjustments to Census Bureau data in order to avoid prison gerrymandering. 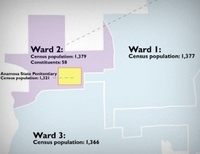 But while state and local governments are increasingly devising their own solutions, many face unique constraints and only the Census Bureau can implement a comprehensive and standardized national solution. The full text of the letter, including a list of signers, is available at http://www.prisonersofthecensus.org/letters/feb2013.html. 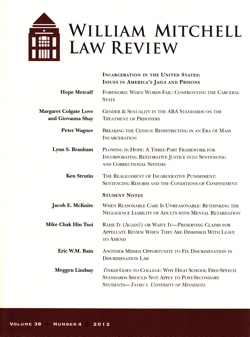 The William Mitchell Law Review has published Peter Wagner's new, highly-readable introduction to the problem of prison-based gerrymandering and its remedies. Above the 98 footnotes is a highly-readable introduction to the problem of prison-based gerrymandering and its remedies. The final section of the article discusses best practices for state and local governments that wish to abolish prison-based gerrymandering. A new Kansas City Star piece by Mary Sanchez warns that prison-based gerrymandering may dramatically inflate the votes cast in a Kansas state legislative district. 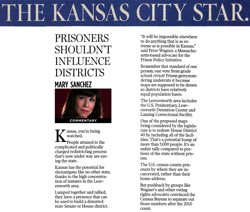 Mary Sanchez has just released a great piece in the Kansas City Star about how prison populations are a big deal in Kansas state legislative redistricting. Kansas has the potential for shenanigans like no other state, thanks to the high concentration of inmates in the Leavenworth area. Lumped together and tallied, they have a presence that can be used to build a distorted state Senate or House district. Prisoner counts can dilute voting power in some areas while falsely ramping it up for voters living near prisons. Remember that standard of one person, one vote from grade school civics? Prison gerrymandering undercuts it because maps are supposed to be drawn so districts have relatively equal population bases. The Leavenworth area includes the U.S. Penitentiary, Leavenworth Detention Center and Lansing Correctional Facility. One of the proposed maps being considered by the legislature is to redraw House District 40 by including all of the facilities. That’s a potential bump of more than 5,000 people. It’s an unfair tally compared to portions of the state without prisons. The U.S. census counts prisoners by where they are incarcerated, rather than their home address. But pushback by groups like Wagner’s and other voting rights advocates convinced the Census Bureau to separate out those numbers after the 2010 count. Meaning if Kansas wanted to play this game fairly, it could. In fact, Kansas is considered a model for addressing the temporary residency of college students and military personnel. The Kansas legislature needs take swift action to remove prison populations from the population data used for redistricting purposes. Otherwise the state will dilute the votes of every resident who doesn’t live next to a prison, and become a dramatic national symbol of how prison-based gerrymandering dilutes your right to vote.